– Teen boys talk about teen girls; one says that a teen girl liked a post of his. Teen boys talk about having girls over after a basketball game (they don’t). A song’s lyrics include, “I’m too hot.” Two teen girls talk about going to see “Hairspray,” and a teen boy says, “Oh, dudes in tights.” Several teen girls hug a teen boy. ► Several women wear cleavage revealing dresses and tops. A woman wears tops with the shoulders cut out in several scenes throughout the movie (bare shoulders are seen). - Three teen boys walk onto a frozen lake and slide around playing until one breaks through the ice followed by the other two; one boy pushes another boy back onto the ice and is accidentally kicked in the face causing him to fall under water and sink below the surface; two boys end up with hypothermia but recover, and a rescue team gets into the water with hooks and trawl the bottom of the lake until they find the third boy and pull him to the surface (we see that his skin is gray and we are told that he does not have a pulse). After being pulled out of a frozen lake, a teen boy spits out water as he is placed in an ambulance and EMTs perform CPR on him until he arrives at the ER, where the medical staff continues with CPR; they also use a defibrillator to shock him several times and inject him with epinephrine to try to get his heart started and we see a deep bloody cut on the boy's arm. An unconscious teen boy is extubated by a medical team: the boy seizes and thrashes uncontrollably and the staff settles him and puts an oxygen tube at his nose. A man is unable to wake up his wife and we hear that she has gone into a diabetic coma (she recovers and is fine). ► A teen boy shoves another teen boy on the basketball court and they argue and call each other names and shove each other before they are told to stop by the coach. A teen boy wobbles as he walks after getting dizzy from a playground ride. A teen boy is airlifted to a hospital and his mother, who is afraid of heights, hyperventilates as she is helped into a helicopter. While in a panic, a woman backs her car into a road where another car narrowly misses hitting her and honks. 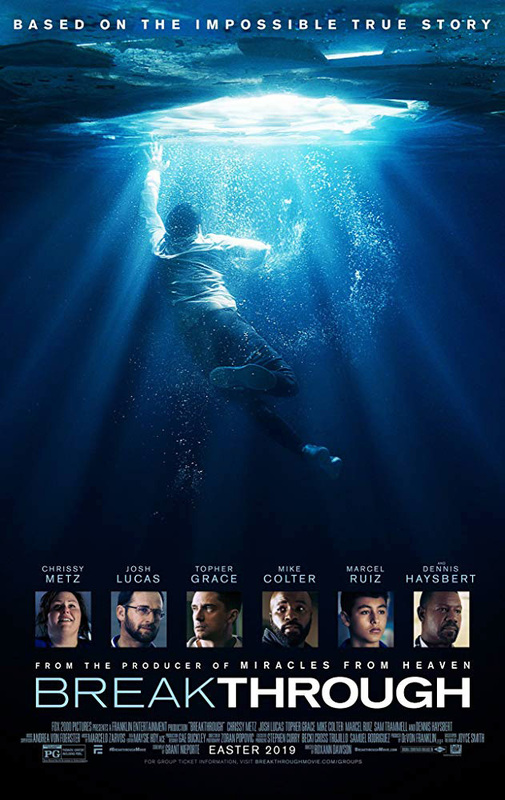 A teen boy imagines being under water and struggles to get to the surface, and then takes a deep gasping breath. ► A woman prays over her teen son in the ER and she shouts and yells for Jesus to help him. A woman and a man argue over the use of a conference room for meetings and the woman leaves frustrated. A young boy cries and asks his adoptive mother why his biological mother didn't want him. A man tells his wife that people are gathering at a hospital waiting for their son to die. A woman yells at doctors and people gathered at a hospital and tells them that there should be no negative thinking or conversation in the area. An unconscious teen boy is said to have a fever of 104 degrees. ► A doctor describes a teen boy's lungs being filled with blood, that they had to keep injecting him with adrenaline to keep his heart beating. A doctor tells a man and a woman that their son probably will not survive through the night. A doctor tells a man and a woman that their son is suffering from catastrophic injuries and that if he survives he will be severely neurologically impaired. We hear that a woman who is diabetic is dehydrated and was in a diabetic coma. A woman asks a teen boy why God chooses to save some and not others and goes on to explain that her husband died. A note on a boy's locker reads, "Why are you so lucky and my mom is dying?" A woman tells her teen son that she can call his basketball coach and he becomes upset and tells her not to. A woman talks about her teen son exasperating her to no end. A teen boy ignores his mother in several scenes; he's usually listening to music with earphones in. A teen boy is embarrassed when his mother tells two teen girls that she was trying to follow them on Instagram, but must be doing something wrong. A teen boy tells his teacher that he did not prepare an assignment because he was too busy and she threatens to give him a failing grade. A basketball coach tells a teen boy that he will bench him if he gets a failing grade. A pastor asks his congregation to show who is "addicted to The Bachelor," and then describes the person in the show as being unable to commit, like some being unable to commit to their faith. While conducting an underwater search for a teen boy, one rescue member says, "He's a goner." A woman talks about having put her son up for adoption when she was 18. ► A worship band plays music at a church service that includes a rap portion and a woman in the congregation is not happy (we hear the she wrote a letter of complaint). - A woman takes insulin for her diabetes and a teen boy is injected several times with epinephrine and a drug to keep him in a coma through an IV. People in a bar are shown with beers in glasses. - Science vs. faith, Martin Luther King, Jr., adoption, fear of heights, coincidence, controlling the outcome of everything, kindness, decency, miracles, finding one's purpose, Guatemala. - God's love makes all things possible.